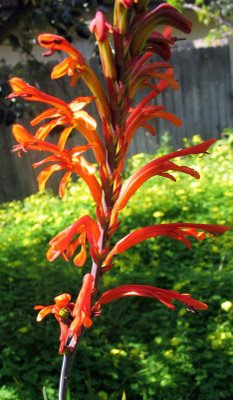 My grandmother (nee Watson) felt a special attachment to the Watsonia, and nurtured a healthy patch of them in her yard. My sister had the foresight to gather some of the corms. She’s moved several times over the last decade, but a colony of those Watsonias moved as she moved. At some point, she passed a couple of starts to me. Rushed for time, I put them into a poorly-chosen patch of ground, not knowing where I might eventually place them. In part, I stuck them in a patch of yellow oxalis (O. pes-caprae) because this was another plant I associated with my grandmother’s yard. That must have been, what, six or seven years ago? I wish I could say these plants were thriving. (Well, the oxalis is: no matter how pretty it may be, it well-deserves its reputation as an aggressively invasive weed.) Recent research tells me Watsonias like loose, well drained soil that doesn’t completely dry out in the summer. Unfortunately, I have them in heavy soil, beyond where the sprinklers reach in our 110° July. Under the circum stances, I’m thrilled that after all these parched summers, the Watsonia still manages to send up its annual stalk of orange blossoms. Wikipedia tells me that Watsonias are out of fashion in a nursery industry that wants to fill that niche with its near-relative the gladiola. I suppose the gladiola is showier, with a dramatic spray of bigger flowers. I do enjoy a gladiola when I see one. But the Watsonias carry me back 50 years to my grandmother’s yard. It is difficult for me to believe that this year will mark the 20th anniversary of my grandmother’s death. It is remarkable how much she is still with us. My brother recently digitized old recordings of her playing ragtime piano. That reminded me that someplace I have several hours of interviews on reel-to-reel that I want to transfer to CD. This week, however, it has been enough to watch the symmetrical rows of orange trumpets catch the sun, and enjoy my grandmother's company as I admire them. As a compulsive reader and pathological scavenger, I cannot pass a box of free books without stopping to rummage. Thus, one day last week on my way off campus, I stopped in the teachers’ room to glance through a stack of culls from the library shelves. Several books looked interesting, but a slim volume titled Boat Builder sent me into—not exactly an out-of-body experience—but certainly 50 years across time. “Robert Fulton,” I said to myself as I glanced at the author: Judson. I was not always a compulsive reader. My mother tells me that as a 3rd grader, I knew how to read by hadn’t quite figured out what it was for. I enjoyed having my parents read to me, but I can remember that every two weeks my mother would take me to the public library in hopes that some book would catch my fancy. It did not happen until I discovered the shelf of biographies by Clara Ingram Judson. In rapid succession, I read every book there. By the time I completed it, I was a lover of both reading and history. 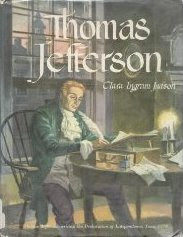 She wrote about people: Thomas Jefferson: Champion of the People and Benjamin Franklin became more than role models, they became personal playmates. Each book enriched my understanding of what one human life could accomplish: Abraham Lincoln (back in print, 2007, Sterling Point Books: Abraham Lincoln: Friend of the People ), George Washington: Leader of the People , Theodore Roosevelt: Fighting Patriot , Mr Justice Holmes , Jane Addams and Hull House, Thomas Edison, Simon Bolivar, Andrew Carnegie, Cyrus McCormick, Sun Yat-Sen, Donald McKay and his Yankee Clippers, John Jacob Astor, William Gorgas curing Yellow Fever, and Christopher Columbus. She wrote about places as if they were people: Sault Ste Marie, and the St. Lawrence Seaway. I look down the list now on Amazon, and I remember every one of them. By the time I got to high school, I did not need to read the history books. I had read biographies of almost everyone mentioned in the texts. The lost violin;: They came from Bohemia , and books on immigrants from Ireland, France, Scotland, and Dalmatia. If you had asked me a week ago where I developed my life-long interest in immigration, I might have traced it to reading Carey McWilliams in my teens, but there it is: reading Clara Ingram Judson before I turned ten. Going through grad school these past five years, I have often been asked to name an author who helped mold me. I always felt a little deficient for not having a ready answer. Now I have an answer, it’s just not what any of the questioners would expect. Judson (1878-1960) would have been a contemporary of my great-grandmother. Among other things, she wrote cook-books for girls and a fiction series of “Mary Jane” books that I never read. You can get Mary Jane now as a Kindle Book, with the reader’s choice of foreign language embedded so that by placing the cursor over a word, the Spanish (for example, Mary Jane - Webster's Spanish Thesaurus Edition ), Italian, German, French, Bulgarian, Polish, Arabic, Kurdish, Farsi, Ukrainian, Czech, Thai, or Urdu translation will appear. Having spent my lifetime thinking about how immigrants assimilate (or fail to), that tickles me. Looking at what she chose to write about, I think it would have tickled Judson, as well. At the end of my thesis, I have a three page selected bibliography. I know, novels don’t usually come with bibliographies, but mine is an historical novel and I’ve put a lot of research into it. As a compulsive reader and a pathological scavenger, I’ve collected ideas from all over. Actually, when I started writing the novel, less than ten years after Judson’s death, I thought I was working on a contemporary. It has only turned into an historical as it has taken me nearly four decades to complete it. In the course of preparation for publication, the thesis will be back in my hands at least once to make some corrections. When it does, I am going to sneak one more book onto the bibliography: something, anything, by Clara Ingram Judson.